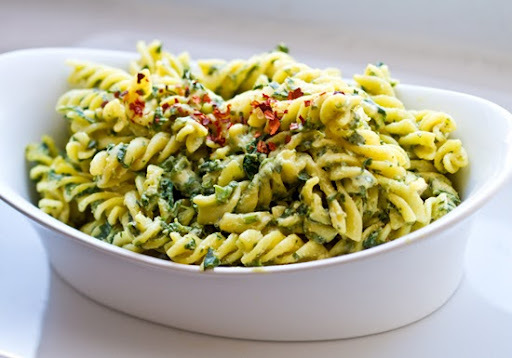 Late fall is a nice time to experiment with easy pasta recipes since most of us are running around like busy little bees, gearing up for the super-busy holiday winter season ahead. Easy, fast, healthy, comfort-food-style pasta dinners can help keep your productive weekdays and nights moving along smoothly. 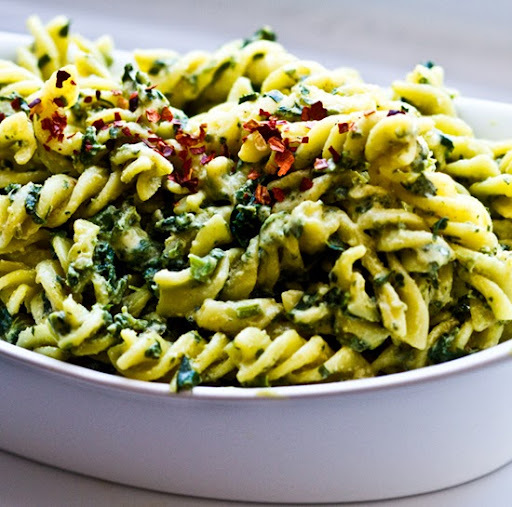 Here's a green pasta recipe that's reminiscent of a Spinach Alfredo. Only my recipe is vegan. Classic Alfredo is a decadent mixture of cheese, butter and sometimes milk/cream melted into a dense white creamy sauce. 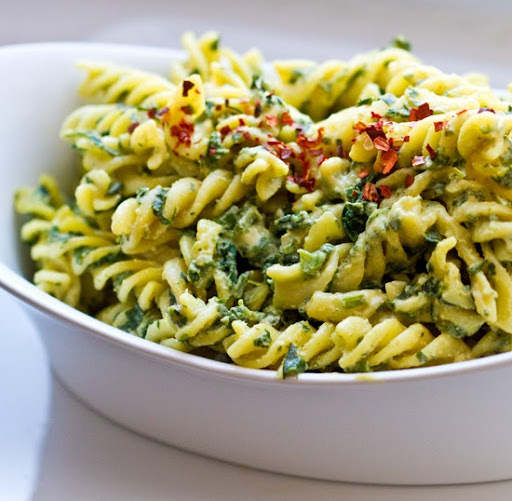 My Easy Vegan Alfredo Sauce is quite different, yet the still creamy, savory, sharp and bold. I'm Not Alfraid-o of Spinach! 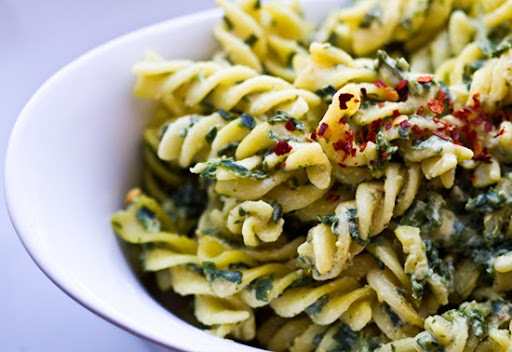 This pasta is accented with lots of healthy, organic spinach. 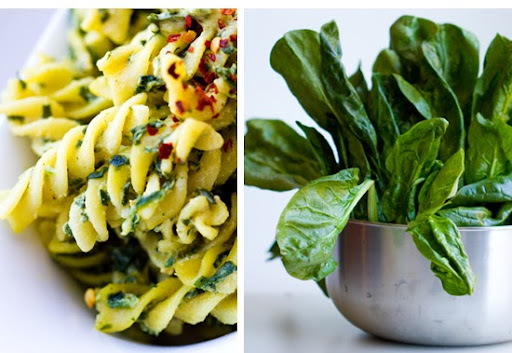 You can easily use fresh or frozen spinach. I just happened to have a leftover half bag of frozen spinach from my Vegan Spinach Dip recipe - so frozen is what I used. Make it a Meal. You can toss in a few vegan sausage slices, grilled tempeh, seitan, various beans or lentils, potatoes or pine nuts. Adding ingredient accents will make it more of a hearty, well-rounded meal. 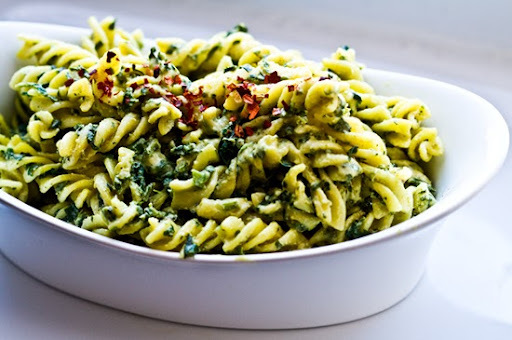 Other ideas..
Fresh basil/garlic can be chopped and sprinkled over top. Fresh diced tomatoes poured over top would be a nice accent as well. I also love One Lucky Duck's Nutritional Yeast $6.75 online. 1. Cook your pasta. Drain. (Reserve 1/3 cup of the starchy hot pasta water). 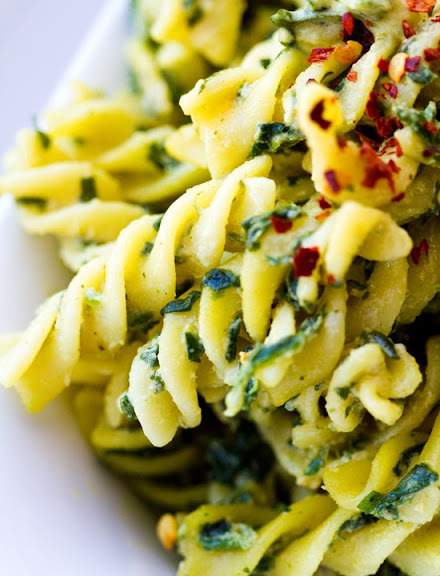 Toss pasta with a drizzle of EVOO (opt'l). 2. Pour drained pasta back into the warm pot you cooked it in. Fold in all the "Alfredo Sauce" ingredients. Since the pasta is still warm, they should all melt together quite nicely. 3. Next, fold in your spinach. You should thaw frozen spinach slightly before folding in. Fresh baby spinach will wilt nicely into the warm pasta. 4. Serve warm or store in fridge overnight! Garnish with red pepper flakes on top.